Dr. Dan Doriani, Adjunct Professor of New Testament at Covenant Seminary and Senior Pastor of Central Presbyterian Church in St. Louis, Mo., has written Women and Ministry: What the Bible Teaches in order to provide a biblical defense for traditional churches that exclude women from official teaching and leadership offices within their congregations. However, his other objective in writing this book is to show that change is necessary. The tradition governing men's and women's ministries in the church can—indeed must—be stretched beyond its current boundaries. There are ways, he argues, to increase women's participation in church ministries without thereby weakening the basic principle of male spiritual authority. Pastor Doriani's high view of women's gifts and his vision of engaging women in every area of church life for the upbuilding of the body of Christ are very encouraging. In addition, his positive remarks about designing grass-roots, decentralized church structures in which men and women work side-by-side—as they did in Paul's churches—are well worth pursuing (130-131). The church, Doriani says, should practice the "principle of participation," whereby gifted, godly women are invited to function informally in just about every area of church life, including areas that involve leading and teaching men; however, women should continue to be barred from the church's authoritative teaching and leadership offices (128-129). Does Dan Doriani's "principle of participation" have the potential to resolve the concerns of both complementarians and egalitarians? After all, if egalitarians are not merely power hungry, but truly support women's deepest desires to have church doors opened wide to their gifts of service and ministry, what difference should it make to women if their participation is formal or informal, titled or untitled, official or unofficial? And, if male leaders in traditional churches are not merely power hungry, but are authentically practicing servant-leadership and expressing it toward women by valuing and making room for the exercise of their gifts, can we not finally call a halt to this wearying battle between egalitarians and complementarians and heave a great sigh of relief? I, for one, am more than happy to heave at least a modest sigh of relief. For Pastor Doriani's proposal to include women's insights and gifts in every area of church life is in fact a large step in the right direction. But is his proposal of informal inclusion, yet formal exclusion, a biblically faithful solution? To determine this we have to examine the premise upon which it is based: the conviction that God has created (at least) one place in the world where women are not God's accountable agents and where women were never intended to exercise responsible dominion; that place is the leadership and teaching offices of Christ's own church. As I will attempt to show in this review, for all the many contributions his practical suggestions would yield, when Doriani's arguments are carefully examined, they appear to rely on the same troubling double-standard approach to biblical truth as other complementarians do. By this I mean that he uses one standard by which to interpret texts when he draws conclusions about women, and a completely different standard when he draws conclusions about men. His teaching in chapter 4 on the meaning of creation is a perfect example of this double standard which sets his whole position off course. Even though he employs somewhat different arguments than those I have previously critiqued (see "Man and Woman at Creation," Priscilla Papers, Vol.18, No.4, Fall 2004, p.5), he similarly reads Genesis 1 and 2 such that the man alone is left with the mandate to exercise responsible dominion throughout the entire creation, while the divine mandate also made to the woman in Genesis 1 is overlooked. Indeed, the twice-repeated "let them rule" command of Genesis 1:26-28, which is collective and pertains to both the man and the woman, is recast by Doriani as if it really says, "Let him (the male alone) rule." This misreading leads Doriani to the conclusion that "Genesis shows that male leadership is a result of God's original plan, not a consequence of the Fall. Male leadership in the church is part of God's design for creation. Therefore, we should expect men to lead the church and the family today" (64). Confident as this three-sentence-summary of creation appears to be, notice how Doriani moves from a global claim about male leadership as an attribute of created manhood to a restricted realm of male leadership confined to the institutions of church and family. What a curious limitation. If leadership is an ontological aspect of manhood, part of the original creation plan, then why does not every man, just by virtue of his manhood, inevitably bring his leadership with him into every circumstance, relationship, and secular and religious institution? Doriani does not explain. Instead, at times he assumes that male leadership is ontological and at other times that it is merely functional—something that a man can leave at the door without thereby ceasing to be a man. It should be noted that a similar being/function confusion lies behind the complementarian formula that the woman is equal to the man in being but different in function. But how is she equal in being if her being does not include, as the man's does, the attribute of leadership? This incoherent treatment of leadership as both ontological and functional lies at the heart of contemporary complementarian theology. But it is a logical contradiction, not an intellectual linchpin. Doriani does not, however, base his conclusions about male leadership solely on a particular interpretation of creation. He believes that all biblical narrative teaches distinctive requirements for male and female leadership. However, here, too, a double-standard hermeneutic appears to be at work. 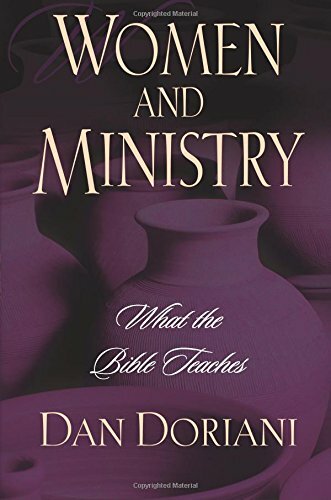 To determine how women may minister in the churches today, Doriani advises us to consult the record of what women were allowed to do in the Bible: "By analyzing those patterns, we can discern what God ordains and what he does not" (24). In chapters two and three of his book he offers a brief survey of the ministries of various prominent women in the Old Testament and during the life of Jesus in order to expose the underlying principles revealed in the narrative. Once we see how biblical women exercised leadership and ministered to the community of faith, he claims, we will know exactly what is (and what is not) authorized for contemporary women: "In principle the scope of women's ministry today should be as broad as it was in the apostolic era" (120, italics original). Perhaps this approach could be called the "hermeneutic of completedness." The fundamental premise of this hermeneutic is that the narratives of biblical women in leadership provide a complete picture of all that God will ever desire from, and authorize for, women's leadership within the community of faith. Because biblical women are seen to incarnate everything necessary for the responsible exercise of women's authority, anything not already patterned by our ancient sisters in the faith is forbidden to women today. In these chapters, then, Doriani proceeds to show what constitutes this biblical pattern. For his Old Testament models, he discusses, among others, Judge Deborah, the prophetesses Huldah and Miriam, and Nahal's wife, Abigail, who later became the wife of David. Among the New Testament models, he selects Priscilla, Mary and Martha of Bethany, and Anna, the prophetess. Doriani strictly scrutinizes the revealed details of each woman's leadership, asking how, when, and where she ministered in order to discover what exactly it is that God allows. When he examines the judgeship of Deborah (Judg. 4-5), for example, Doriani centers on the Israelites coming to her to have their disputes decided. This fact, he argues, proves that Deborah's authority was expressed in private, rather than in public (33). Additionally, he concludes that Deborah's participation with Barak in the defeat of king Jabin proves that, when God calls a woman to lead, it is to lead alongside, and in support of, a man (34). Doriani thus interprets the details of Deborah's judgeship to prove that, while she shared the same title as male judges, Deborah did not have the same level of authority—hers was limited in its practice (private) and limited in its scope (in support of male leaders). To give another example, when he analyzes the ministry of the New Testament prophetess, Anna (Luke 2:25ff), he decides the most significant fact of her ministry was that she approached the infant Jesus after Simeon had already spoken. This fact is said to reveal that Anna's words about Christ were not given directly to her by God in her prophetic office, but were actually Simeon's words which Anna merely "preserved and repeated." Doriani thus asks us to ignore the fact that, by calling her a prophetess, Scripture leads us to regard Anna as a woman to whom, and through whom, God spoke directly. Instead, he directs our attention to the timing of her pronouncement in order to define her as a woman to whom, and through whom, Simeon, not God, spoke directly. From this he concludes that Anna's story, like Deborah's, shows that God does not work with women in a solo capacity, but only when they serve alongside, and in support of, the leadership of men (27). From such examples Doriani derives his position that the biblical pattern that must govern women's leadership and ministry today is this: (1) women may lead alongside and in support of men, and (2) they may teach in private (32). This "hermeneutics of completedness" method of analyzing the biblical material naturally raises a question: has every detail of every woman in leadership in the Bible been considered and correctly interpreted to arrive at what he claims is the normative pattern? For, if God's will for women's leadership is fully incarnated in Scripture and is to be found in the compilation and proper interpretation of revealed details, then no detail may be left out. The revelatory significance of each detail must be considered and weighed in relation to all the others. Furthermore, the analyst must explain the principles by which he determined which of those, among the wealth of details presented in a narrative, are the details that represent God's immutable laws regarding women's leadership. Doriani does not claim to have researched this topic comprehensively. Therefore, how can we be confident of the accuracy of Doriani's assertions? Even if we were able to put this thorny problem aside and accept Doriani's survey of women in leadership in the Bible as completely correct in every detail, his conclusion does not follow that such a catalogue of details constitutes God's revealed will or God's expectations for women's leadership throughout history. Is this how the Bible works? Are the details revealed in all the biblical narratives of leaders intended to provide us with a completed picture of biblical leadership for all times? It is clear from the rest of his book that Doriani has not even convinced himself about this. If the "hermeneutic of completedness" is the proper tool for discerning God-ordained leadership patterns, one should be able to turn to many scholarly surveys in which the details of male judges, kings, prophets, priests, teachers, preachers, elders, and apostles are interpreted to specify laws and patterns which contemporary male leaders must follow. Of course, such studies do not exist. No serious theologian—including Doriani—applies a "hermeneutic of completedness" to biblical narratives of male leaders. Instead, like other complementarians, he draws just one simple conclusion from the entire, complex, detailed story of male leaders in Scripture: God chooses men, not women, to lead His covenant family. The general conclusion that male leadership per se is taught in the Bible only appears to hold up because none of the particular details of male leaders in the Bible have been interpreted as establishing a normative pattern that is binding upon all future males. But consider: the only way Doriani made a general case from the Bible to limit women's leadership was to take the exact opposite approach and attach normative force to particular, selected details (e.g. teaching in private or leading beside men) as if these are the embodiment of God's eternal laws. A clear double-standard is at work: hermeneutics in pink and blue. Doriani gives detailed attention to one particular pattern of male leadership: cultural patriarchy in the Bible. It is simply not possible, he argues in chapter two of his book, to get around the fact that God embedded patriarchy in the very laws of the Old Testament. And these laws, he further argues, prove God's ordination of males to the leadership role. What Doriani finds most compelling about patriarchy is the fact that he sees it as part of biblical law, and since God's law flows from His holy character, we undermine the authority of the Bible if we attempt to "dismiss the laws that command male leadership or the narratives that show it" (39). But of course, as he also acknowledges, Christians have set aside a number of the Old Testament laws without fear of having thus undermined the authority of the Bible. So what makes the laws about patriarchy different? For Doriani, the universal validity of patriarchy is proved by New Testament teachings, and in particular by 1 Timothy 2:12, about which he says, "The narrative pattern we have discovered [referring to patriarchy] is explicitly verified by Paul's statement that he does not permit a woman to exercise authority over a man" (38). But consider the case of monarchy, another institution extensively legislated for in the Old Testament. Are the rules governing kings and the duties owed to them not also laws that flow from God's holy character? Furthermore, should we not privilege monarchy over every other form of government because the New Testament explicitly singles out kings and teaches believers to submit to and honor them (1 Pet. 2:13, 17)? If Doriani's method is valid for determining that cultural patriarchy in the Bible proves that male leadership holds for today, then that method, when applied to the parallel case of monarchy, would seem to require Christians to become devoted monarchists. This is not, however, advocated by any serious complementarians. I would argue that Doriani has selectively applied the "hermeneutic of completedness" to the institution of patriarchy because it supports his views of male leadership, whereas he has no compelling reasons to apply the same hermeneutic to monarchy. The entire complex, detailed revelation about the leadership of men in the Bible simply cannot be boiled down to this one, simple, complementarian law: God has ordained that men in general are eligible to serve as the "principal leaders of his covenant family" (38). What is completely obscured with this approach is the fact that neither in the Old nor in the New Testaments is the male gender ever a sufficient criterion to establish eligibility for leadership. In every case, God selected particular males who fit particular criteria to serve in certain limited and specific kinds of offices. All males who did not belong to the designated tribes or the designated families were as completely and universally excluded from offices of spiritual and civic leadership in Israel as were all females. By the same token, when Jesus selected His foundational witnesses, only twelve Jewish males were chosen. "Men in general" simply were not eligible for the leadership position of apostle. If all of today's non-Jewish pastors of traditional churches had been alive during Old Testament times or during the lifetime of Jesus, their male gender notwithstanding, they would have found themselves as completely excluded from spiritual leadership as is any woman in a traditional congregation today. So what happened in salvation history to throw open the door to spiritual leadership for Gentile pastors? How did those who, outside of Christ, saw themselves as irrevocably excluded as any woman, find themselves not only saved, but designated the church's only official leaders? This is where the complementarians step in with what they claim is the bedrock truth of creation: the leadership birthright of males. With this view of creation, when a male comes to the cross, Christ bestows the gift of sonship, but merely recognizes the pre-existent leadership eligibility the man already possesses. Since a woman's ontology does not include leadership, she has nothing to bring to the cross apart from her desperate need for a Savior. Therefore, following her rebirth as a Christian "son," Christ finds no official leadership eligibility to recognize in her. Here we see what results when complementarians sever women from the full ontological claims of creation. The bone to bone and flesh to flesh oneness of gendered humanity, called to image God and extend His rule throughout the creation, is replaced by a humanity consisting of a pair of ontologically dissimilar and therefore unequal creatures, only one of whom has the aspect of leadership (or dominion or authority). In this way complementarians have re-styled woman as a non-responsible, non-authoritative, subordinate being throughout all time. Complementarianism: Faithful to Truth or Faithful to Tradition? It seems that in order to preserve the tradition of male authority and female submission, Doriani, too, employs gender-biased interpretive tools that make the Bible speak divergent truth regarding men and women. How is it that he (as well as other contemporary complementarians who have sought to defend the tradition of male authority from Scripture) either does not recognize the double-standard inherent to his method or actually considers it acceptable? I think it is because, like all complementarians, he begins with a particular interpretation of Ephesians 5, 1 Timothy 2, and 1 Corinthians 11 and 14 and believes that all the rest of Scripture's teaching about women must be conformed to the limitations taught by these passages, reading these limitations, perceived as universal, backward even into the creation account. Here is how he explains it: "Traditionalists take [these texts] at face value for two reasons. First, we think Paul's teaching rests on permanent principles, not temporary conditions. Second, we find consistency between the general principle that women have gifts . . . and the particular command that women must not exercise authority over men" (141). Later, he explains: "We reaffirm longstanding interpretations of Scripture and ways of life . . . We gather biblical data to reaffirm what was once accepted without question" (168, emphasis added). And there it is. Because of his commitment to the longstanding tradition of excluding women from leadership offices within the church, Doriani does not search the Bible to test the validity of this tradition. He searches the Scriptures to show how the Bible can be interpreted such that it proves a tradition to which he has already pledged his allegiance. And, like his fellow complementarians, he appears unable to build his proof on anything but the weak foundation of a double-standard hermeneutic. But do not modern-day complementarians enjoy the full weight and support of all of history as well as the theology of the church fathers and of the great reformers Calvin and Luther? Therefore, does not the charge of a double-standard hermeneutic taint all these faithful theologians of the past? I do not believe it does. I think Doriani is correct in his assessment that in the past the tradition was simply "accepted without question" and that "church leaders rarely gave sustained attention to women's issues until the last century" (148). There was no perceived need for either the church fathers or the reformers to give the issue of women's leadership theological attention. Male leadership was nearly universally practiced; its justness, its fitness, appeared entirely consistent with the everyday experiences of men and women. Thus, while the 21st century church has indeed inherited a tradition of male authority, it did not inherit a fully worked out theology of male authority. It has been left to the complementarians of the modern era to attempt to write a systematic defense. However, the theology that has been offered up to do the job appears to be illogical (it requires that leadership be treated as both ontological and functional) and contrived (it requires a double-standard hermeneutic to make all the biblical pieces fall properly into place). Ultimately, despite complementarianism's stated devotion to the full truth of Scripture, within its framework, the Bible no longer speaks with a single voice. Rather, in its place, complementarianism gives us a Bible with a separate message for each gender. Surely this is not the legacy that complementarians intend to bequeath to the church. While I welcome Dan Doriani's desire to write a book that will stretch the boundaries of our inherited tradition and increase opportunities for meaningful participation by women in the church, the Body of Christ does not need more partisan theologians willing to defend that inherited tradition at all costs. We need, instead, men and women of faith who, while riding full of zeal toward Damascus, are willing to be knocked off their horses. For surely, if our zeal is for God rather than for our own deeply believed viewpoint, God himself will meet us on the way. Christiane Carlson-Thies has been a CBE member since its founding in 1987. She lives with her husband and son in Annapolis, MD, where she is self-employed as a telecommunications consultant.